A question I often get when I’m wearing my APL sneakers is if I like them for running or do I like them for the gym? Are they comfortable? How is sizing? So today I am sharing a full review on APL sneakers. 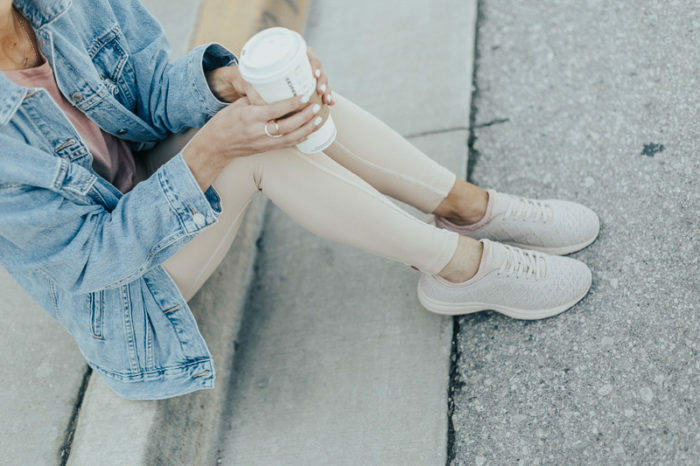 If you haven’t heard of APLs yet, you’ve likely seen them — those low-profile, subtly branded sneakers that have been taking over Instagrams everywhere and one of the Kardashians favorite workout shoe. APLs caught my eye over a year ago when I noticed a gal wearing them in NYC, and I couldn’t identify the brand. They weren’t Nikes, or Adidas and I loved how they look and wanted to get my hands on a pair! My first pair here (this exact style) I wore non-stop to gym class and running. This was right after Greyson was born and i was ready to get back into shape and wanted to look stylish while doing so! I needed all the motivation. The shoes have great support and have held up really well and being worn during high-intensity workouts and runs the past year. Since they I purchased 4 more pairs. I like that they are lightweight, while still providing great cushion. I think whether or not to splurge on these is a matter of how much sneakers mean to you. I wear sneakers a lot of the time and I love a stylish pair, reliable pair, so these are great for me and why I buy them over and over again. Sizing- for me, I wear pretty thin socks so I stayed to my true size, however, if you wear thick socks or are in between sizes, size up half a size! Let me know if you guys have any other questions! More fitness related posts here! A few APL sneaker styles 50% off here. Great post! These sneakers are gorgeous, and I’ve been needing a new pair for a while now. I love how they come in soft feminine colors as well. Love these shoes! But, I haven’t figured out where to tuck the laces in without feeling them. Any tips? What do you do with the laces? Do you just tuck them and get use to the annoyance of them or cut them? I tie a bow (like normal) on the inside. It doesn’t bother me, but I know everyone is different!